How does Hamlet kill Polonius in the Shakespearean tragedy, Hamlet? Question: How does Hamlet kill Polonius in the Shakespearean tragedy, Hamlet? 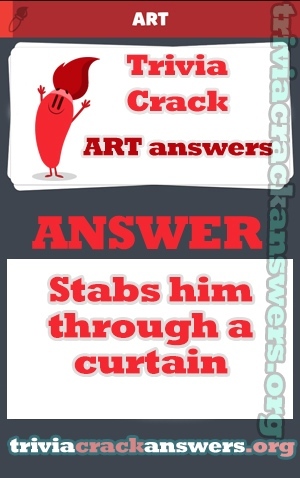 Answer: Stabs him through a curtain. Who succeeded Hugo Chavez after his death in Venezuela? Farrokh Bulsara is better known as what? Who is Bart Simpson’s best friend? Which of these terms is not used in bowling? What country does the ‘Bullet Train’ run in? Welcher der folgenden Schauspieler gewann einen Oscar für seine Hauptrolle im Film “Gladiator”?